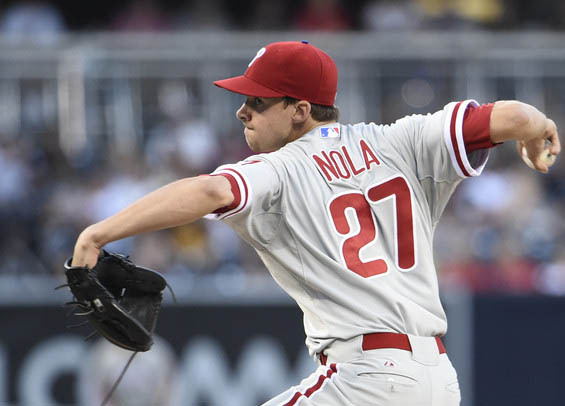 According to pitch f/x data from BrooksBaseball.net, opponents are hitting a combined .414 against Aaron Nola's sinker and curve over his four starts to open the season. In comparison, opponents hit just .171 against those same two pitches over his first four appearances last year. Hitters are also being more selective against Nola, swinging at nearly 12% fewer fastballs than a year ago and nearly 7% fewer off-speed pitches. It's not an issue of velocity for Nola, but instead poor command and location of pitches. A little more than 46% of all of his four-seam fastballs have been balls this year, compared to just 26% last year over his first four starts. Opponents are hitting .317 (13-for-41) on pitches over the plate where an outcome is recorded. Last year over the first four starts they hit just .175 (7-for-40). “I don’t know,” Nola said following last night's loss. “I’m going to look into kind of what’s going on and just keep working. It happens to everybody, I think. I’m not going to hang my head about it because there’s a lot of baseball left. I’ll still go out there and compete." “His command is his calling card," said Phillies manager Gabe Kapler. "He’s got movement, deception, life. And those things are still there. He just needs to put the ball where he wants to throw it. I think he’s making mechanical adjustments along the way and hasn’t found the right one to enable him to have his pinpoint command, the command that he normally has.